4 large ripe tomatoes – I substituted this with 200ml tomato juice. Cut the courgettes into chunks. Heat the oil and brown the courgettes with the chopped onion. Add the finely chopped (or grated) tomatoes – or the tomato juice. Season with salt and pepper and allow to simmer. Meanwhile in a separate pan of water, bring the rice to the boil. Cook for 5 minutes and drain well. 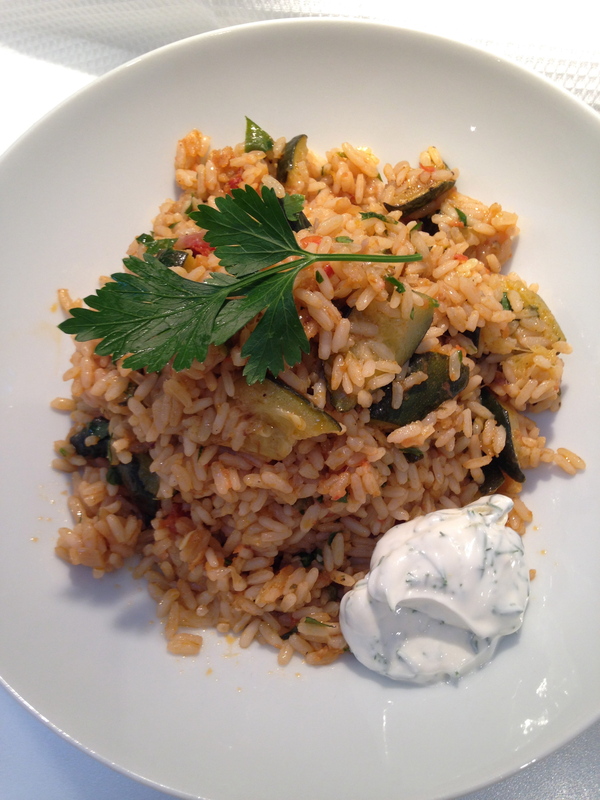 Add to the courgette-tomato mixture and simmer until the rice has cooked – about 10 – 15 minutes. Serve with bread, feta and even a little fennel-flavoured yoghurt.